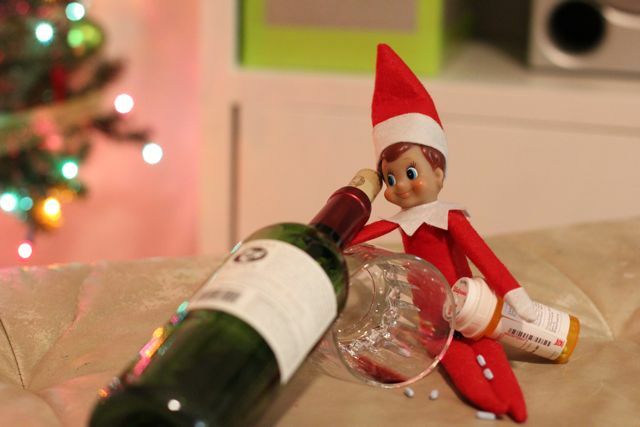 I don't have kids, but this Elf on the Shelf thing is starting to appear on my Facebook feed. Elf On The Shelf could be the Stupidest Thing Ever Invented. One of my friends, Don Martelli, is taking photos of his Elf on the Shelf every morning to track where he turns up. Don has named his Elf on the Shelf, Bernard. He says his kids love it. "My wife and I love the Elf on the Shelf because the joy that it brings our young daughters, who are eight and six. Every morning they rush downstairs to see what hijinx Bernard has gotten into the night before. This year, we took it a little bit further by giving Bernard a Twitter handle so he could "talk" to the kids and chat with his other Elf friends. Next year, we're thinking about maybe a podcast...kidding, but maybe not." Sounds likes loads of fun. Let's look into the Elf on the shelf a little more, starting with Don's photos. At this point I would imagine that the kids are freaking out that Bernard moves around the house at night on his own. I would be. Freaking. Out. Reminds me of scary clowns. It gets worse, as Don mentioned above, Bernard is on twitter. Bernard even found me on twitter after I left a message for him on Don's Facebook page! Bernard also has a list of other Elves on the Shelf that are on twitter. I also just found Elf on the Shelf on twitter too. This elf is on the Social Media Outposts! I don't like Bernard the Elf on the Shelf. - Touted as "the best thing since The Night before Christmas"
Year after year, children and adults alike are baffled by the mystery of how Santa really knows who’s been naughty or nice. After much urging by the elves and Mrs. Claus, Santa has allowed his biggest secret to be revealed in The Elf on the Shelf: A Christmas Tradition. At the start of each Christmas season, the elf appears to serve as Santa's eyes and ears, traveling back to the North Pole each and every night to make a detailed report of the day’s activities. This keepsake gift set includes a light skin, blue eyed boy North Pole pixie scout elf and a hardbound watercolor picture book. Children can register their elf online to receive an official adoption certificate and a special letter from Santa. Oh wait, there's an Elf on the Shelf website... and a movie! Why do I see elves in stores? I thought they came from Santa. Every Elf on the Shelf comes from Santa Claus. Some come direct from the North Pole to your house, and some come from special adoption centers that Santa has approved. The adoption centers are often located inside certain stores. Much like you would go to the store to adopt a pet, your Elf on the Shelf can be adopted, too. The important thing to remember is that no matter how an elf gets to his or her family, they are all on the same special mission: to be Santa’s eyes and ears during the holiday season. I'm ready to bake Christmas cookies & make snow angels & sing Christmas carols & wear ugly holiday sweaters. Buddy can visit me any time! Does the Elf on the Shelf visit your home? Who can resist the holiday fun of scaring the children into good behavior? Ask any of history’s most efficient dictators — they’ll tell you. Christmas just isn’t Christmas without the naughty-nice punishment paradigm. Where would this holiday be without its good old-fashioned behavioral paranoia? Charles Dickens may get all the credit for this, but do also consider George Orwell. That’s what makes “The Elf on the Shelf” so ingeniously successful. I'm not going to say I've never shrieked "Santa's watching!!" at my misbehaving kids in a moment of sheer desperation, but on the whole, I really do try to avoid using the fear of being passed over by a mythical bearer of gifts as motivation. Kids are supposed to be going to sleep and having visions of sugarplums this time of year, not visions of mean-spirited elves spying on their every move. Let me just come out and say that I think this whole Elf on the Shelf scam is one huge bag of crazy and it’s not just because I’m so upset that I didn’t come up with concept my$elf... although I’m all for creating an Orwellian experience for your child, isn’t there something inherently Big Brother about this Elf thing? Big Brother as in unAmerican? Is hating country really the message that we want to send to our children? Rabbi Rat on the Shelf: A Hanukkah Tradition Since 5 Minutes Ago. According to Wikipedia, The Elf on the Shelf: A Christmas Tradition "since 2005." How many years does a thing need to be in existence to become a tradition. Smart marketing to include " A Christmas Tradition" in the product name.